I’m still not convinced that this is the best thing to do. But Barefoot volume one is long out of print and for some people, difficult to find. Putting my introduction into the blog also gives me the opportunity to add some references, ‘virtual’ endnotes, as it were. Please remember the introduction was written some time ago and mainly addressed the documents which preceded the Register of Irish female orphans. Not exclusively so, I might add, although my major concern was to ask readers if they agreed with my suggesting the first boatload of Earl Grey orphans “were wrongly condemned from the outset”? It is still worth debating. Given the different backgrounds of the young women, that there were more than 4,000 of them, and that over time, they were scattered the length and breadth of rapidly changing societies in Eastern Australia, we should not be surprised to find their history is a mixed one. It is as complex as the human condition itself. I’ll insert my 1991 introduction in stages. It will give the reader time to absorb what it says and i hope, respond to my interpretation. “Keats and Chapman were conversing one day on the street…there passed a certain character who was renowned far and wide for his piety, and was reputed to have already made his own coffin, erected it on trestles, and slept in it every night. ‘Did you see our friend?’ Keats said. That will do to start with. If you double click or pinch the pages above, they should become larger and easier to read. I’ll have a look for some references. The best printed record of the various reports concerning the Earl Grey scandal is found in Votes and Proceedings of the Legislative Council of New South Wales, 1850, volume 1, pp. 394-436. Included there (pp. 407-28) is the report from Irish Poor Law Commissioner C. G Otway, defending the selection process of the orphans. See also British Parliamentary Papers, 1000 volume Irish University Press edition, Colonies Australia, volume 11, Sessions 1849-50, pp. 510ff. which provides the names of the young women only identified by their initials in the Otway Report. SRNSW (State Records New South Wales) 9/6190 Immigration Correspondence, 12 October 1848, has the minutes of evidence of the Sydney Immigration Board re the Earl Grey. I’m unsure if the same numbering system is still in use. Oliver Mac Donagh, “Emigration during the Famine” in The Great Famine, eds., R.D. Edwards & T. D. Williams, Dublin, 1962, p.357. Disagreement among practitioners is the ‘stuff’ of history. What I was intimating here is even good historians sometimes get it wrong. 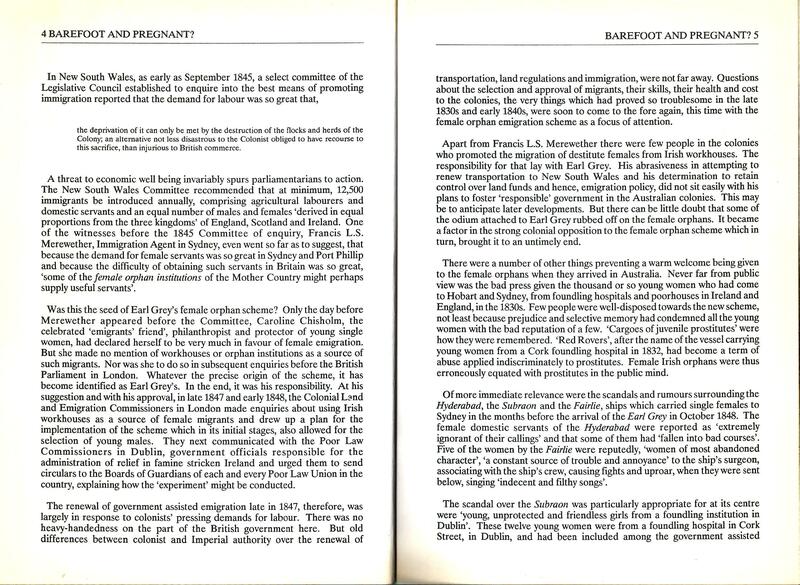 British Parliamentary Papers, IUP edition, Colonies Australia, volume 11, Sessions 1849-50, Papers Relative to Emigration, New South Wales, Fitzroy to Earl Grey, 16 May 1848, Enclosure 1, pp.131-3. In May 1848, Merewether reported on the Hyderabad (arrived 19 February) the Surgeon was ‘unequal to the office and should not be again employed in this service’; ‘the immigrants as a body failed to give satisfaction to the public’; ‘the single females…proved to be utterly ignorant of the business undertaken by them’; ‘several…did not go into service..or very shortly left…for the purpose of going upon the streets’ (p.131). Re the Fairlie (arrived 7 August) ibid., pp.145-7, ‘a third of the female immigrants arrived in an advanced stage of pregnancy’ (p.145); ‘filthy songs‘ (p.147). Re the Subraon (arrived 12 April), ibid, pp.147-51. 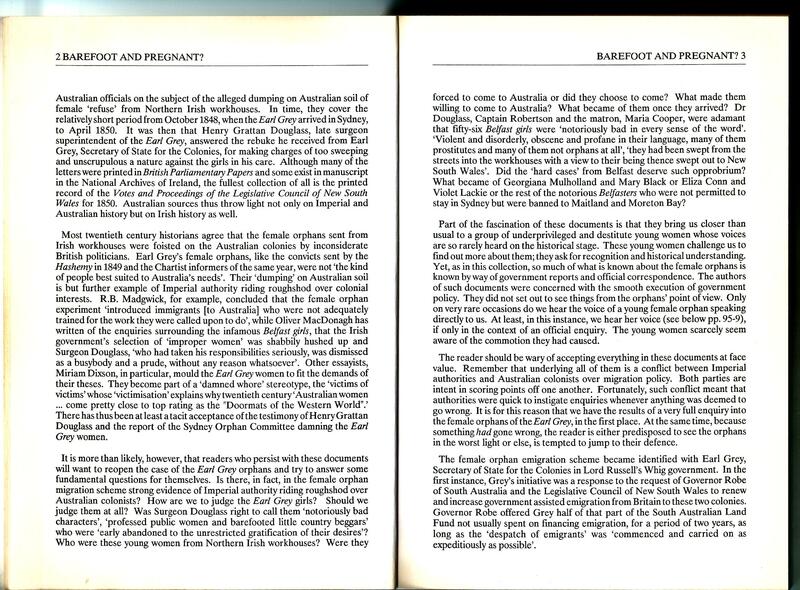 I have a copy of the Minutes and Proceedings of the Immigration Board at Sydney respecting certain irregularities which occurred on board the ship “Subraon” Printed for the use of the Government only, 1848. The Board met between May and July 1848. It is a ‘negative’ copy i.e. white text on a dark background which makes me think it was printed from a microfilm. My unreliable memory tells me i got it from what was then the Archives Office of NSW. But for the life of me I cannot find the exact reference. Was it at AONSW 9/6197, pp. 147-61? we’ll need to check. 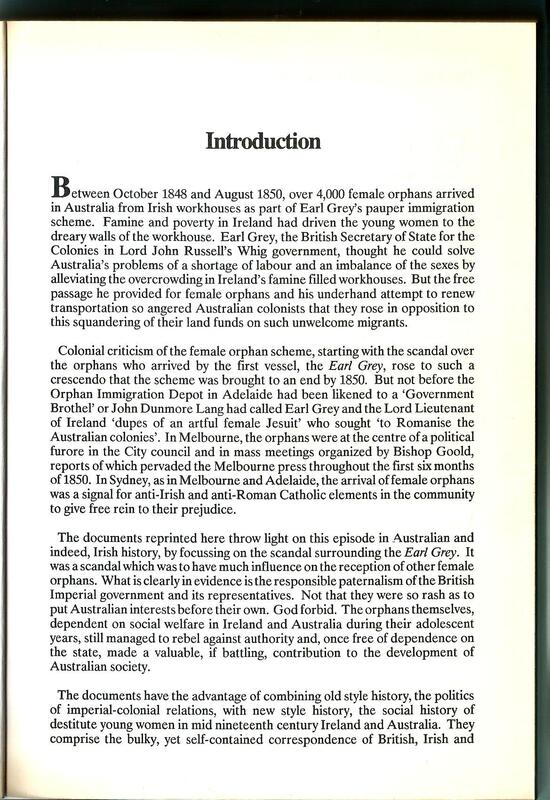 This entry was tagged "Belfast Girls", Earl Grey, Earl Grey orphans, Francis Merewether, Government Assisted migration to Australia, Governor Robe, Henry Grattan Douglass, Hyde Park Barracks, Irish Famine orphans, Irish Famine orphans to Australia, Irish female emigration, Kay Caball, origins of the Earl Grey scheme, Subraon, Thomas Arbuthnot. Bookmark the permalink. Hi Trevor, it’s been fascinating reading your blog and research, what a mammoth undertaking! I recently discovered that my GGGGrandmother Mary Flanagan was a passenger on the William & Mary at age 18 (she ended up marrying and living in Carcoar NSW, I’m descended from their daughter Martha). I haven’t been able to find a copy of Barefoot & Pregnant to buy online so would hugely appreciate any info you might be able to give me regarding Mary, the Rathdrum workhouse (she was from Wicklow), and the William & Mary voyage. It’s disturbing to read that the crew were deemed to have mistreated their charges. Poor Mary!! All the best with your continuing research. Lovely to hear from you and sorry I cannot give you the attention I’d like to just now–a couple of medical matters to attend to. May I suggest you contact Perry at http://www.irishfaminememorial.org I’m sure she’d love to hear from you. She may even have seen the Rathdrum workhouse records. What’s in Barefoot should be copied on to the database at that site. And Peter Higginbotham’s workhouse website should tell you more. Thanks Trevor. You are as always an inspiration. I am a New Zealand descendant of one of the Orphans from the Downpatrick Workhouse. Fanny Sheridan/Carson/Walsham, who was on the Derwent, was my Great Great Great Grandmother. I am still researching her life in Australia before her and her husband and 5 children came to NZ. Thanks for these excerpts from Barefoot and Pregnant. I have made many requests for the book here in NZ to no avail. It furthers my knowledge of those amazing young girls. Keep up the good work, Trevor. I sent Perry my further research on Jane Hogan, expanding on the entry in your book. She told me that it would be passed on to you. Still disappointed that her name is not recorded on the memorial especially as my name is recorded as a donor. Thanks for including me. I regret I cannot reply or study every time. Life here is “like Pitt St” some days and predicatably notable lethargy for us both the next. Like today. One recurring Q in my mind is still “Whatever happened to that missing ? in your recent “B&P1 Introduction (a)” ? I’m hoping to get back to your (36) soon with some comment . I will also value any new refs you may add. It’s lovely to hear from you Eleanor. May i wish you both all the best for 2017?